Habitat Chronicles: Quiz: Can You Read This? Quiz: Can You Read This? 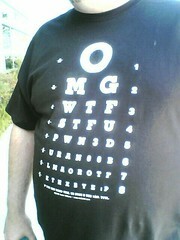 For a clear image of the shirt design, see Can you read my new T-Shirt? (Improved! Now with Interactive Content™), another entry in the Randy’s T-Shirts series. Random Lunacy | Posted by Randy at 10:12 AM | You can comment. Trackbacks are closed.